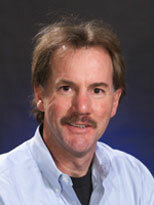 Dr. Tim Johnson is a physical chemist specializing in spectroscopy in the THz, infrared, near-IR and UV-vis domains. Work includes transmission, reflectance and other spectroscopic methods for gases, liquids and solids. Tim was a member of a team involved in building the Northwest Infrared Database, a quantitative vapor-phase infrared spectral library used for a multitude of purposes, including environmental monitoring, hazardous material response, biomass burning and general research. He also is part of several collaborative efforts for applied and basic science involving fundamental spectroscopy, both infrared and Raman, and is working to develop sensors and methods, both Fourier transform infrared spectrometer-based and laser-based systems for atmospheric chemical sensing as well as for security purposes. He also has significant experience in UV-visible spectroscopies including absorbance, reflectance and cryogenic techniques. Before joining Pacific Northwest National Laboratory (PNNL), Dr. Johnson conducted atmospheric chemistry research at the Max Planck Institute for Chemistry in Mainz, Germany, and worked as an FTIR applications and development scientist at Bruker Optics. He also served as a senior research scientist in sensor development for atmospheric chemistry at York University in Toronto, using matrix isolation FTIR, intracavity laser absorption spectroscopy, and infrared diode laser spectroscopy. Spectral Signatures - Solids, liquids, pollutants, WMD etc. Bryan S.A., T.J. Johnson, and C.R. Orton. 2015. Enhanced Uranium Ore Concentrate Analysis by Handheld Raman Sensor: FY15 Status Report. PNNL-24903. Richland, WA: Pacific Northwest National Laboratory. Johnson T.J., T.A. Blake, C.S. Brauer, Y. Su, B.E. Bernacki, T.L. Myers, and R.G. Tonkyn, et al. 2015. "Reflectance Spectroscopy for Sample Identification: Considerations for Quantitative Library Results at Infrared Wavelengths." In International Conference on Advanced Vibrational Spectroscopy (ICAVS 8), July 12-17, 2015, Vienna, Austria, 454-455. Vienna:ICAVS. PNNL-SA-113555. Akagi S., R.J. Yokelson, I.R. Burling, D. Weise, J. Reardon, S. Urbanski, and T.J. Johnson. 2014. "First Look at Smoke Emissions from Prescribed Burns in Long-unburned Longleaf Pine Forests." In Proceedings of 4th Fire Behavior and Fuels Conference, February 18-22, 2013, Raleigh, North Carolina and July 1-4, 2013, St. Petersburg, Russia, edited by DD Wade and RL Fox, 23-25. Missoula, Montana:International Association of Wildland Fire. PNNL-SA-98297. Johnson T.J., D. Weise, E.N. Lincoln, R.L. Sams, M. Cameron, P. Veres, and R.J. Yokelson, et al. 2013. Final Report for SERDP Project RC-1649: Advanced Chemical Measurements of Smoke from DoD-prescribed Burns. PNNL-23025. Richland, WA: Pacific Northwest National Laboratory. Weatherall J., J.B. Barber, C.S. Brauer, T.J. Johnson, Y. Su, C.D. Ball, and B. Smith, et al. 2013. "Adapting Raman Spectra from Laboratory Spectrometers to Portable Detection Libraries." Applied Spectroscopy 67, no. 2:149-157. PNNL-SA-85809. Sweet L.E., C.H. Henager, S.Y. Hu, T.J. Johnson, D.E. Meier, S.M. Peper, and J.M. Schwantes. 2011. Investigation of Uranium Polymorphs. PNNL-20951. Richland, WA: Pacific Northwest National Laboratory. Johnson T.J., S.D. Williams, N.B. Valentine, and Y. Su. 2010. "The hydration number n of calcium dipicolinate trihydrate, CaDP center dot nH(2)O, and its effect on the IR spectra of sporulated Bacillus bacteria." Vibrational Spectroscopy 53, no. 1,Sp.Iss.SI:28-33. PNNL-SA-68142. Johnson T.J., T.A. Blake, R.L. Sams, and S.D. Burton. 2010. "Absolute Infrared Cross Sections of Gas-Phase H2O2 Using Fourier Transform Mid-Infrared Spectroscopy." In Fourier Transform Spectrometry, OSA Technical Digest, April 26-30, 2009, Vancouver, BC, Canada, Paper No. FWA6. Washington Dc:Optical Society of America. PNNL-SA-64316. Lincoln E., W. Hao, S. Baker, R.J. Yokelson, I.R. Burling, S. Urbanski, and J. Miller, et al. 2010. "A Prescribed Fire Emission Factors Database for Land Management and Air Quality Applications." In American Geophysical Union. Fall Meeting, December 13-17, 2010, San Francisco, California, Paper No. A21B-0037. Washington Dc:American Geophysical Union. PNNL-SA-77481. Blake T.A., J.F. Kelly, N.B. Gallagher, P.L. Gassman, and T.J. Johnson. 2009. "Passive Standoff Detection of RDX Residues on Metal Surfaces via Infrared Hyperspectral Imaging." Analytical and Bioanalytical Chemistry 395, no. 2:337-348. PNNL-SA-64981. Forrester J.B., N.B. Valentine, Y. Su, and T.J. Johnson. 2009. "Chemometric Analysis of Multiple Species of Bacillus Bacterial Endospores Using Infrared Spectroscopy: Discrimination to the Strain Level." Analytica Chimica Acta 651, no. 1:24-30. PNNL-SA-66451. Johnson T.J., S.D. Williams, N.B. Valentine, and Y. Su. 2009. "The Infrared Spectra of Bacillus Bacteria Part II: Sporulated Bacillus-the Effect of Vegetative Cells and Contributions of Calcium Dipicolinate Trihydrate, CaDP·3H2O." Applied Spectroscopy 63, no. 8:908-915. PNNL-SA-64041. Johnson T.J., Y. Su, N.B. Valentine, H.W. Kreuzer-Martin, K.L. Wahl, S.D. Williams, and B.H. Clowers, et al. 2009. "The Infrared Spectra of Bacillus Bacteria Part I: Vegetative Bacillus versus Sporulated Cells and the Contributions of Phospholipids to Vegetative Infrared Spectra." Applied Spectroscopy 63, no. 8:899-907. PNNL-SA-64040. Aker P.M., T.J. Johnson, R.M. Williams, and N.B. Valentine. 2007. Feasibility Study of Using Short Wave Infrared Cavity Ringdown Spectroscopy (SWIR-CRDS) for Biological Agent Detection. PNNL-16595. Richland, WA: Pacific Northwest National Laboratory. Williams S.D., T.J. Johnson, T. Gibbons, and C.L. Kitchens. 2007. "Relative Raman Intensities in C6H6, C6D6, and C6F6: A Comparison of Different Computational Methods." Theoretical Chemistry Accounts 117, no. 2:283-290. PNNL-SA-46036. Johnson T.J., T. Masiello, and S.W. Sharpe. 2006. "The Quantitative Infrared and NIR Spectrum of CH2I2 Vapor: Vibrational Assignments and Potential for Atmospheric Monitoring." Atmospheric Chemistry and Physics 6, no. 9:2581-2591. PNNL-SA-47406. Sharpe S.W., T.J. Johnson, D.M. Sheen, and D.A. Atkinson. 2006. "Relative Infrared (IR) and Terahertz (THz) Signatures of Common Explosives." In SPIE Proceedings, 6378, 63780A. Bellingham:SPIE Publishing. PNNL-SA-52110. Johnson T.J., N.B. Valentine, and S.W. Sharpe. 2005. "Mid-Infrared Versus Far-Infrared (THz) Relative Intensities of Room-temperature Bacillus Spores." Chemical Physics Letters 403, no. 1-3:152-157. PNNL-SA-43394. Redington R.L., T.E. Redington, T.A. Blake, R.L. Sams, and T.J. Johnson. 2005. "18O Effects on the Infrared Spectrum and Skeletal Tunneling of Tropolone." Journal of Chemical Physics 122. PNNL-SA-41670. Thompson S.E., A. Heredia-Langner, T.J. Johnson, N.S. Foster, N.B. Valentine, and J.E. Amonette. 2005. "Statistical Analysis of Noisy Signals Using Classification Tools." In ASQ World Conference on Quality and Improvement Proceedings, 59, 333-334. Milwaukee, Wisconsin:American Society for Quality. PNNL-SA-44674. Foster N.S., N.B. Valentine, S.E. Thompson, T.J. Johnson, and J.E. Amonette. 2004. "FTIR Transmission and Photoacoustic Spectroscopy for the Statistical Identification of Bacteria." In Proceedings of SPIE - Chemical and Biological Point Sensors for Homeland Defense, edited by Arthur J. Sedlacek III, Richard Colton, Tuan Vo-Dinh, 5269, 172-182. Bellingham, Washington:SPIE (International Society for Optical Engineering). PNNL-SA-39817. Foster N.S., S.E. Thompson, N.B. Valentine, J.E. Amonette, and T.J. Johnson. 2004. "Identification of Sporulated and Vegetative Bacteria using Statistical Analysis of Fourier Transform Mid-Infrared Transmission Data." Applied Spectroscopy 58, no. 2:203-211. PNNL-SA-38461. Johnson T.J., B.A. Roberts, and J.F. Kelly. 2004. "Semiactive Infrared Remote Sensing: A Practical Prototype and Field Comparison." Applied Optics 43, no. 3:638-650. PNNL-SA-38399. Johnson T.J., R.L. Sams, and S.W. Sharpe. 2004. "The PNNL Quantitative Infrared Database for Gas-Phase Sensing: A spectral Library for Environmental, Hazmat, and Public Safety Standoff Detection." In Chemical and Biological Point Sensors for Homeland Defense. Proceedings of the SPIE, edited by Arthur J. Sedlacek III, Richard Colton, Tuan Vo-Dinh, 5269, 159-167. Bellingham, Washington:International Society for Optical Engineering. PNNL-SA-41172. Sharpe S.W., T.J. Johnson, R.L. Sams, P.M. Chu, G.C. Rhoderick, and P.A. Johnson. 2004. "Gas-Phase Database for Quantitative Infrared Spectroscopy." Applied Spectroscopy 58, no. 12:1452-1461. PNNL-SA-43641. Valentine N.B., T.J. Johnson, and S.W. Sharpe. 2004. "On the Relative Strengths of Bacillus Spore Signatures in the Terahertz (THz)Versus the Mid-Infrared." In Proceedings of the SPIE, 5585, 122-127. Bellingham, Washington:International Society for Optical Engineering. PNNL-SA-42979. Johnson T.J., B.A. Roberts, G.P. Morgen, M.A. Hughes, C.D. Heitschmidt, and J.F. Kelly. 2003. "A New 'Semi-Active' Method for Chemical Standoff Detection." In Chemical and Biological Standoff Detection, Proceedings of the SPIE, edited by James O. Jensen, Jean-Marc Theriault, 5268, 113-124. Bellingham, Washington:SPIE Int Society Optical Engineering. PNNL-SA-41763. Sharpe S.W., T.J. Johnson, P.M. Chu, J. Kleimeyer, and B. Rowland. 2003. "Quantitative Infrared Spectra of Vapor Phase Chemical Agents." In Chemical and Biological Sensing IV, edited by PJ Gardner, 5085, 19-27. Bellingham, Washington:SPIE. PNNL-SA-38355. Sharpe S.W., T.J. Johnson, P.M. Chu, J. Kleimeyer, and B. Rowland. 2003. "Quantitative Infrared Spectra of Vapor Phase Chemical Agents." In Proceedings of SPIE-The International Society for Optical Engineering: Chemical and Biological Sensing IV, 21-22 April, 2003, Orlando, Florida, USA, edited by Gardner, Patrick J., 5085, 19-27. Bellingham, Washington:SPIE. PNNL-SA-40930. Thompson S.E., N.S. Foster, T.J. Johnson, N.B. Valentine, and J.E. Amonette. 2003. "Identification of Bacterial Spores using Statistical Analysis of Fourier Transform Infrared Photoacoustic Spectroscopy Data." Applied Spectroscopy 57, no. 8:893-899. PNNL-SA-38571. Hatchell B.K., W.W. Harper, C.R. Batishko, T.J. Johnson, D.M. Sheen, T.L. Stewart, and J.F. Schultz. 2002. Fieldable Fourier Transform Spectrometer: System Construction, Background Variability Measurements, and Chemical Attack Warning Experiments. PNNL-14054. Richland, WA: Pacific Northwest National Laboratory. Johnson T.J., R.L. Sams, T.A. Blake, S.W. Sharpe, and P.M. Chu. 2002. "Removing Aperture-Induced Artifacts from Fourier Transform Infrared Intensity Values." Applied Optics 41, no. 15:2831-2839. PNNL-SA-35176. Sharpe S.W., R.L. Sams, and T.J. Johnson. 2002. "The PNNL Quantitative IR Database for Infrared Remote Sensing and Hyperspectral Imaging." In Proceedings : 31st Applied Imagery Pattern Recognition Workshop : 16-18 October 2002, Washington, D.C., 45-48. Los Alamitos, California:IEEE Computer Soc. PNNL-SA-38622. Sharpe S.W., R.L. Sams, and T.J. Johnson. 2002. "The PNNL Quantitative IR Database for Infrared Remote Sensing and Hyperspectral Imaging." In Proceedings. 31st Applied Imagery Pattern Recognition Workshop, 45-48. Los Alamitos, California:IEEE Computer Society. PNNL-SA-38755. Sharpe S.W., R.L. Sams, T.J. Johnson, P.M. Chu, G.C. Rhoderick, and F.R. Guenther. 2002. "Creation of 0.10 cm-1 Resolution, Quantitative, Infrared Spectral Libraries for Gas Samples." In Vibrational spectroscopy-based sensor systems, 1-2 November 2001, Newton, [Mass. ], PROCEEDINGS- SPIE THE INTERNATIONAL SOCIETY FOR OPTICAL ENGINEERING, edited by Steven D. Christensen; Arthur J. Sedlacek, 4577, 12-24. Bellingham, Washington:Society of Photo-optical Instrumentation Engineers (SPIE). PNNL-SA-35216. Schiller C.L., S. Locquiao, T.J. Johnson, and G.W. Harris. 2001. "Atmospheric Measurements of HONO by Tunable Diode Laser Absorption Spectroscopy." Journal of Atmospheric Chemistry 40, no. 3:275-293. PNWD-SA-5243. Sharpe S.W., R.L. Sams, T.J. Johnson, and P.M. Chu. 2001. "Intensity Artifacts in Gas Phase FTIR Spectroscopy: Focus on the Aperture." In Fourier Transform Spectroscopy, 2001. Trends in Optics and Photonics, 51, 123-127. Washington, District Of Columbia:Optical Society of America. PNNL-SA-33754.